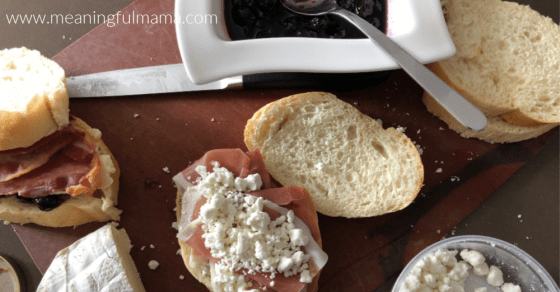 Today I get to share with you how to create a gourmet grilled cheese party and menu. Not only will I provide a variety of grilled cheese ideas, but I will also give you a free printable with the gourmet grilled cheese menu. Doing a grilled cheese party is really easy. 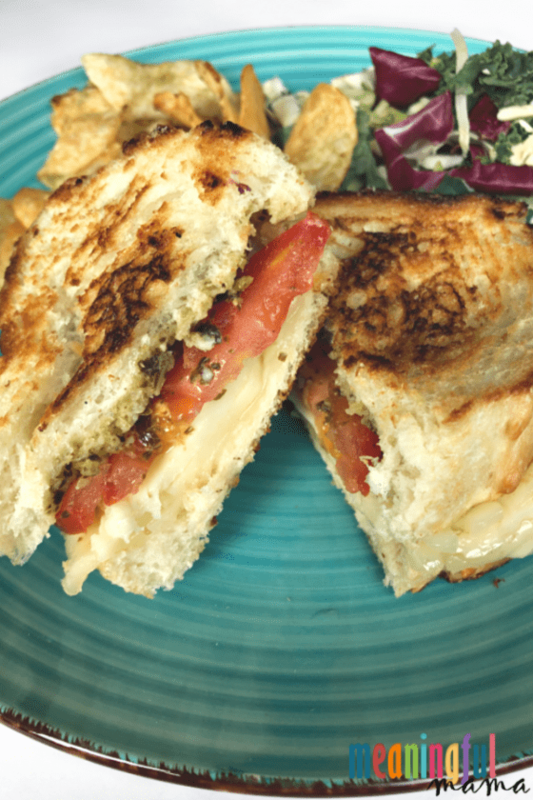 The concept is one that entices guests because who doesn’t love a grilled cheese? Not only did we serve gourmet grilled cheese sandwiches, but we also served a classic cheddar grilled cheese to accommodate your eaters that are less adventurous. 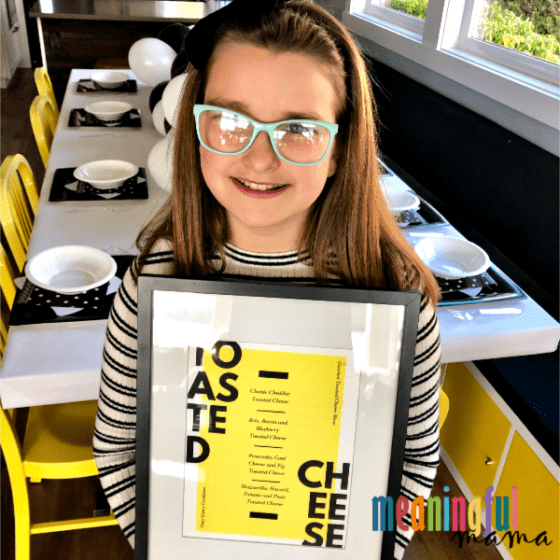 This grilled cheese party and menu was created for my daughter’s 10th family birthday party. Why grilled cheese? I chose grilled cheese because Kenzie is my cheese girl. She is so picky, but if you offer her grilled cheese, mac & cheese, tortilla and cheese or cheese and crackers, she is all in. Can you guess what her favorite food is? You can see how we made mac & cheese cups at her sunshine birthday party. 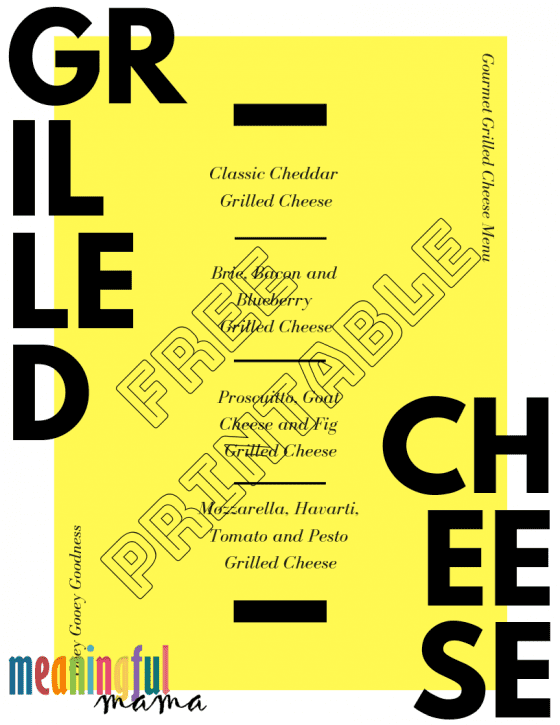 For her birthday party I created gourmet grilled cheese party menu, which I’m offering as a free printable. Don’t let the image above make you panic. I have officially, through the creation of this post, learned that they are not called “toasted cheese.” I have since fixed my free printable as shown below. What is the Difference Between Toasted Cheese and Grilled Cheese? 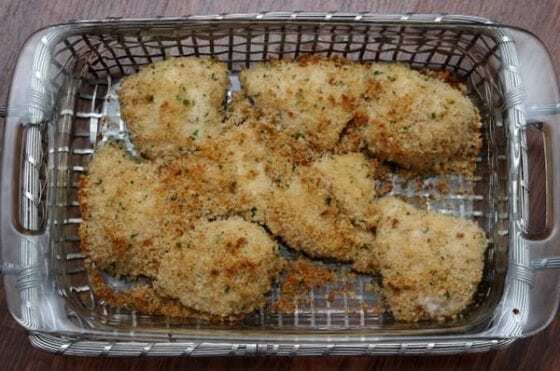 Growing up, I always called cheese between two piece of bread, made on a griddle or pan “toasted cheese.” When I hosted the party, I called them toasted cheese. The day after the party I was hanging out with one of my youth group kids and made her gourmet “toasted cheese” sandwiches. She said, “I’ve never heard them called that, but I like it.” This caused me to second guess myself. I decided to reach out to my Facebook audience for the real term and received 100’s of responses. So, there you have it! The proper name for cheese melting on the stovetop in between two slices of buttered bread is grilled cheese. I need to now retrain myself…and my kids. Four different sandwiches were made for this party. 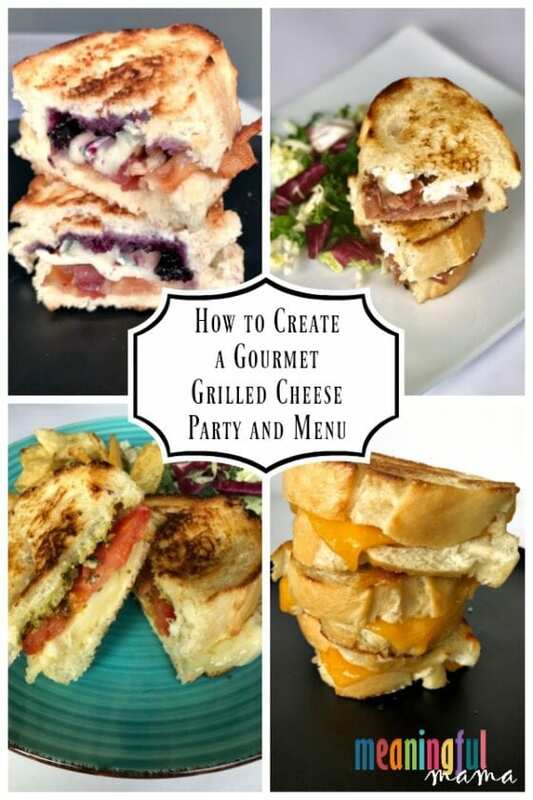 In showing how to create a gourmet grilled cheese party and menu, I will share the recipes with you now. I use the term “recipe” lightly because the ratios are up to you. The flavor combinations is what is determined. Out of this menu, the kids chose the classic grilled cheese. The adults couldn’t decide. They sampled it all. Everyone was delighted. Choosing a favorite was difficult for some. Others had their favorite, but that varied among the guests. The variety provided helped meet the taste buds of each palate at the party. 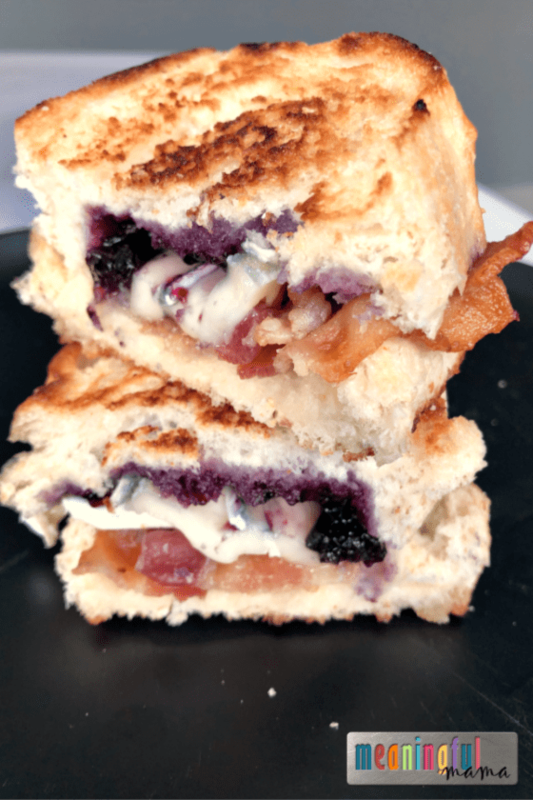 I had to share the gourmet brie, bacon and blueberry sauce grilled cheese first because it was my personal favorite. Others voted for this one as well. The alliteration of the recipe is an extra bonus. The bacon was made in the oven. The brie was sliced thinly. The blueberry sauce was homemade using the recipe from my ever so delicious salmon, blueberry and goat cheese recipe. The prosciutto, goat cheese and fig spread grilled cheese was also enjoyed and a favorite of some. I adore goat cheese. I’ll add goat cheese to my crêpes, my egg scrambles and my stuffed chicken recipe. My one advice for ratios here is to do a couple slices of prosciutto and a generous amount of goat cheese. Again, I love goat cheese. The fig spread I purchased at Safeway, but you can also find fig spread on Amazon if your local grocery stores are more limited. 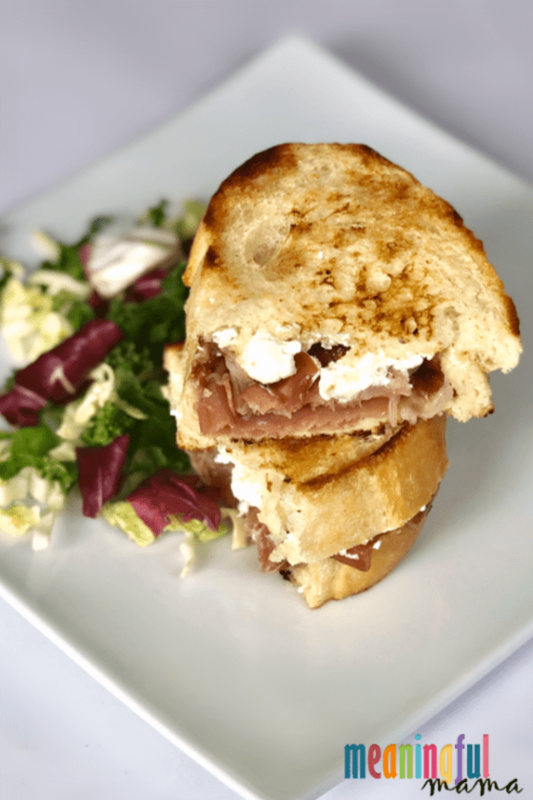 This sandwich helped create more variety for those who lean toward Italian flavorings. I added the havarti to the mozzarella to add depth of flavor and more of the ooey gooey goodness that a grilled cheese provides. The party wouldn’t be complete without a classic cheddar grilled cheese. All the kids would have complained without this favorite. 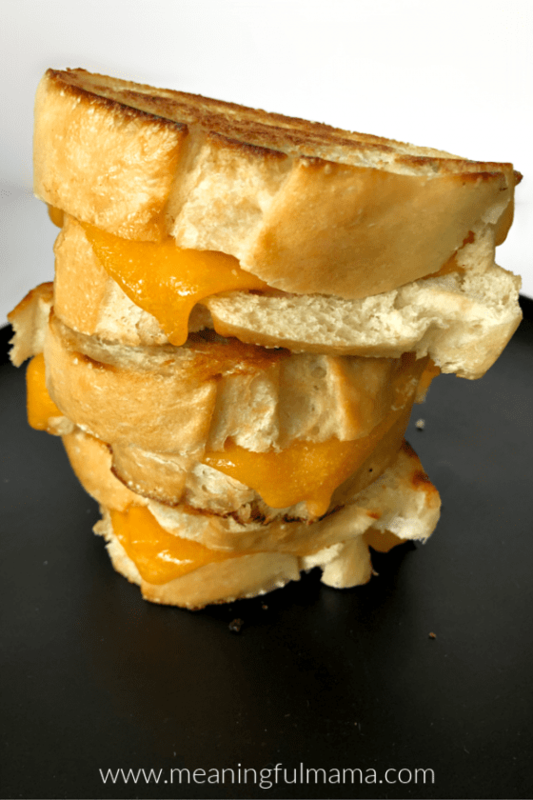 This post wouldn’t be complete if I didn’t really show How to Create a Gourmet Grilled Cheese Party and Menu. Pick out your bread. An amazing bread is so important when you are making a gourmet toasted cheese. I chose the Italian loaf from Costco. I love a country Italian. A classic cheddar is great on sourdough. French bread is another option. Decide on your sides. I made a large kale and mixed green salad with candied nuts, feta and poppyseed dressing. I also served kettle chips. Make sure you have a griddle and griddle pans available. Having multiple set-up is key to quick service. Prep your ingredients before the party. 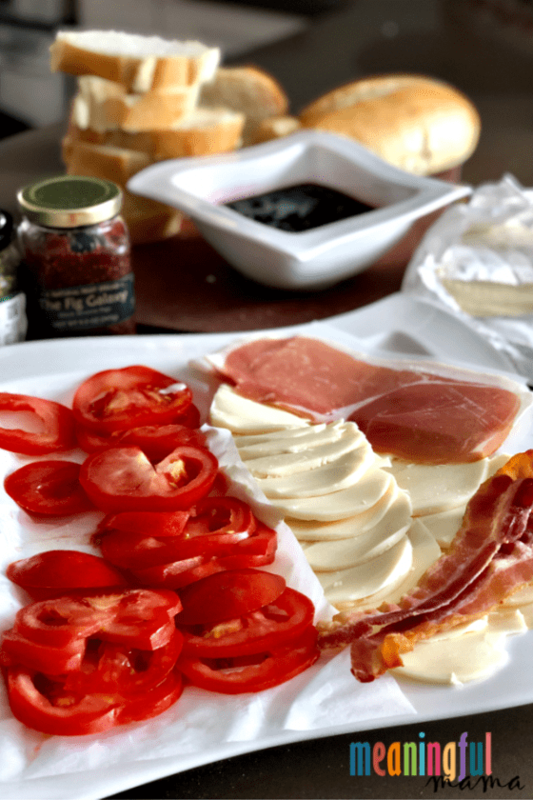 It’s great to have the cheese, tomatoes and bread sliced before the gathering. The bacon should be made as well. I did not slice the brie beforehand because it is so soft it tends to stick to everything. When my guests arrived I gave them the option of ordering from the menu or having me just make a bunch so people could try each one. Everyone picked the latter. If I were you, I would just plan for that. Next, prep the sandwiches. It goes really fast. Do not butter the bread. I have a tip for this to go quick. Just calculate how many you want to make and stack them. I added all of my sandwiches stacked onto a jelly roll pan and covered with plastic wrap until I was ready to put them on the griddle. The next tips is a jewel. I learned this when I was trying to feed the youth group kids grilled cheese at our last retreat. Rather than buttering each slice of bread, which can take forever, butter the griddle. Just take a cube of butter and unwrap half way. Let the griddle melt away at the butter as you move it around to cover the surface. Don’t forget to re-butter when flipping to the other side. This makes cooking grilled cheese for the masses so much quicker and easier. Grill to perfection. If you are making many, you might want to have two people manning the griddle. You officially have everything you need to entertain your guests with your own grilled cheese party. Next time you gather with friends, you will delight everyone with these flavors. They don’t need to know how easy it was. 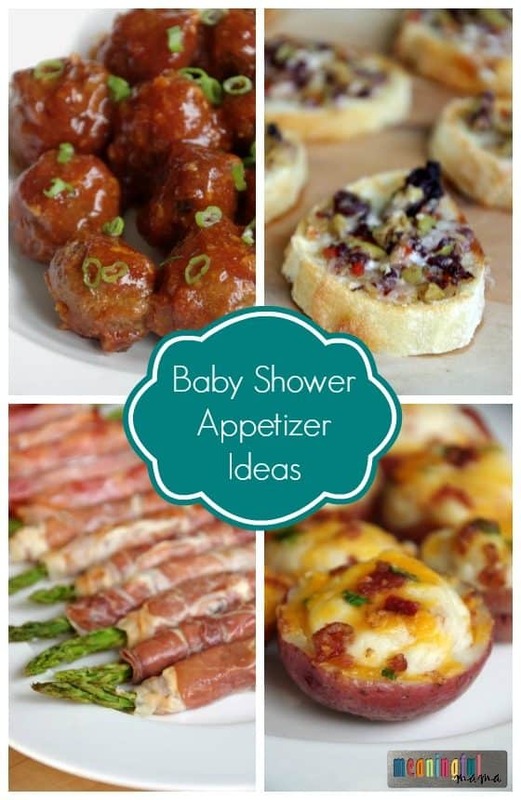 Want More Fun Party Food Ideas for Feeding Many? 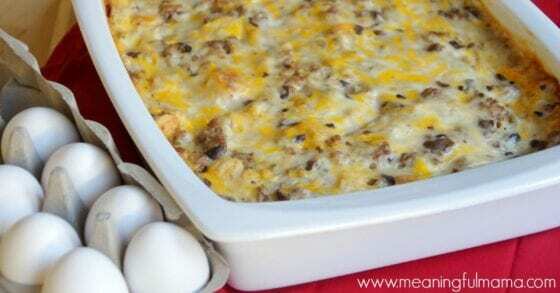 How About Breakfast for Dinner? OH MY GOSH. These all look absolutely delicious! Thank you SO much for sharing – I can’t wait to try some of these grilled cheeses at home! Oh wow these look amazing! What a creative party idea! That’s so clever – I’d never have thought to do grilled cheese as a party spread – but why not, everyone loves it and you really classed it up! It was so fun. Thanks so much. Everyone was definitely satisfied!